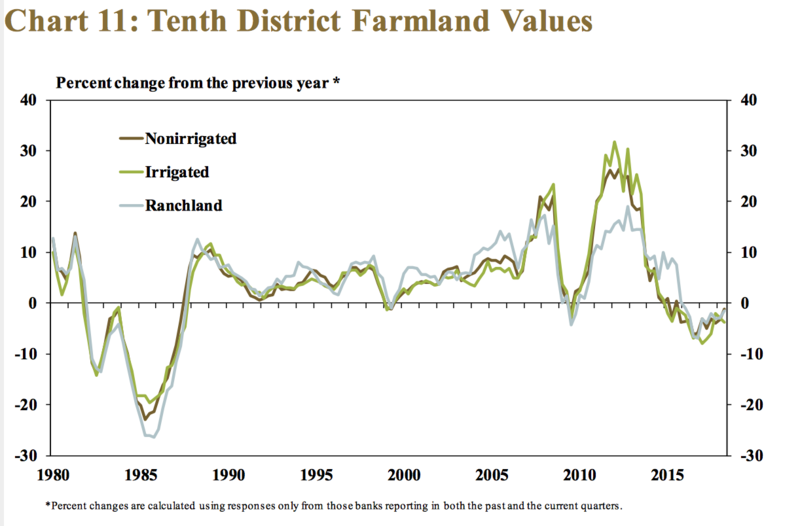 On Thursday, the Federal Reserve Banks of Chicago, St. Louis and Kansas City released updates regarding farm income, farmland values and agricultural credit conditions from the second quarter of 2018. 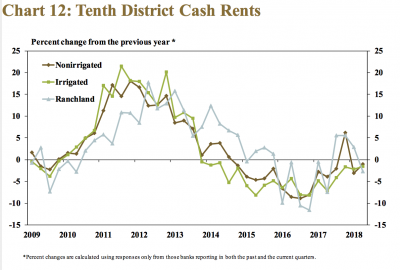 Recall that the Federal Reserve Bank of Dallas issued a similar update last month. Today’s update highlights core findings from Thursday’s reports. Graph from the Federal Reserve Bank of Chicago, AgLetter (August 2018). 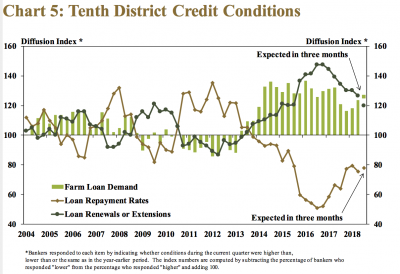 The Ag Letter noted, “In the second quarter of 2018, agricultural credit conditions for the District slid again. Repayment rates for non-real-estate farm loans were lower in the second quarter of 2018 than a year earlier. 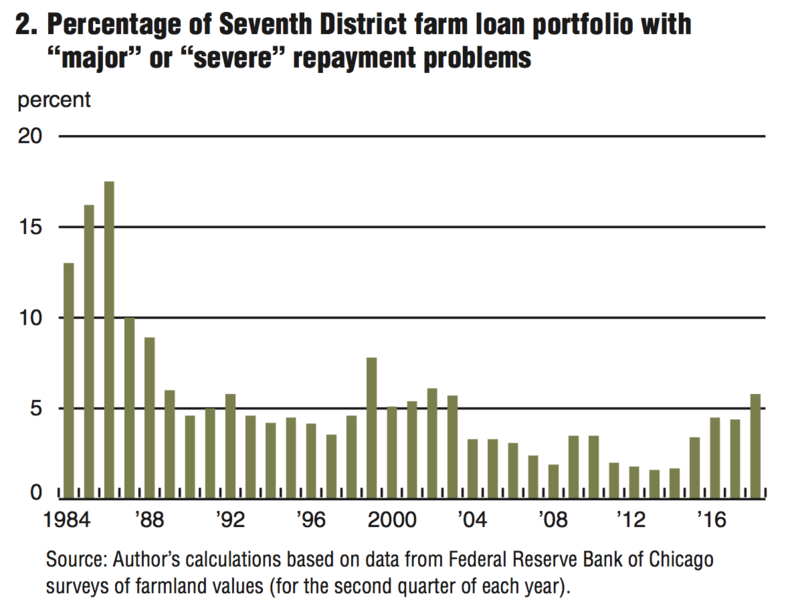 The proportion of the District’s agricultural loan portfolio reported as having repayment problems increased some from a year ago, reaching mid- year levels not seen since 2002. 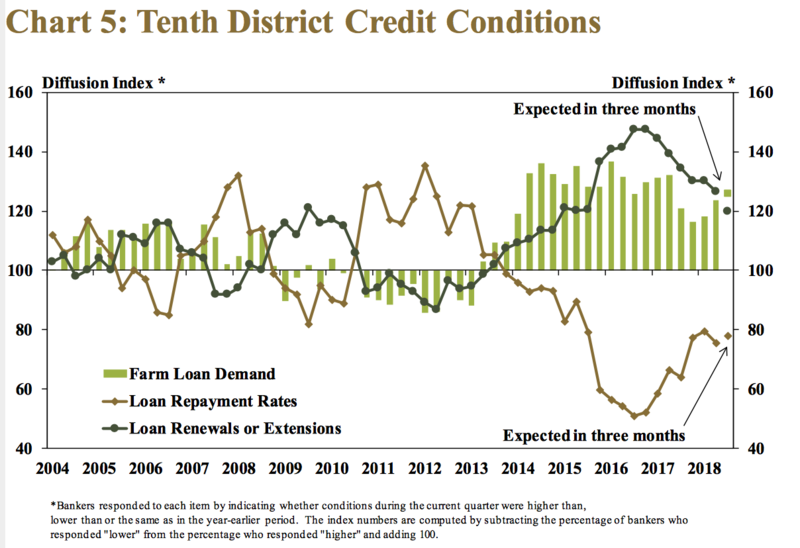 Graph from the Federal Reserve Bank of St. Louis, Agricultural Finance Monitor (August 2018). 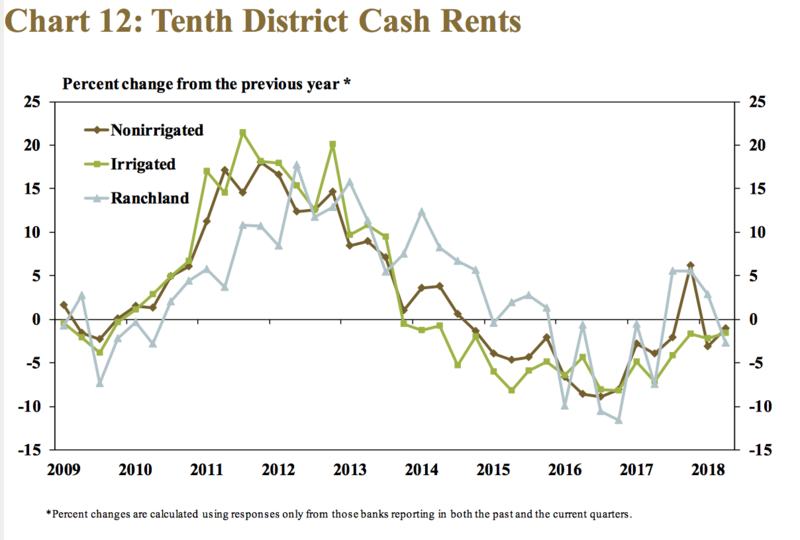 Quality farmland values decreased by 3.5 percent compared with a year ago, while cash rents increased by 0.4 percent relative to a year ago. 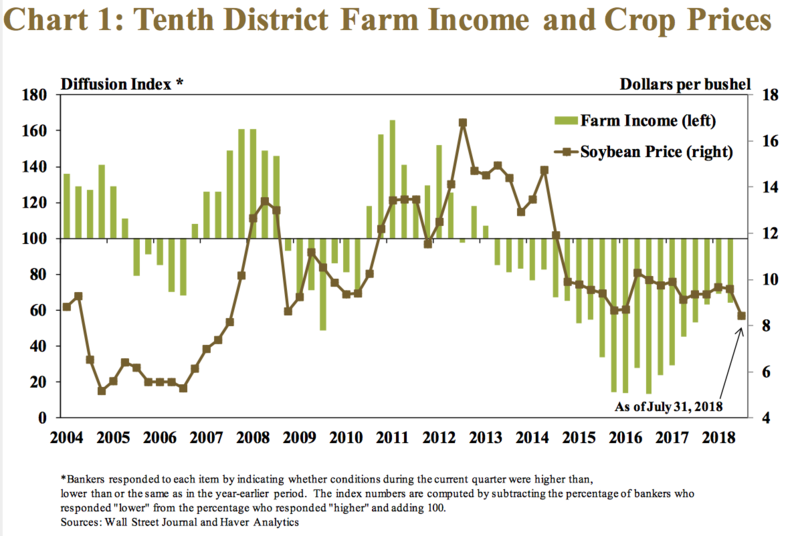 Nathan Kauffman and Ty Kreitman, writing in Thursday’s Ag Credit Survey from the Kansas City Fed, noted that, “A decline in farm income accelerated slightly in the second quarter as crop prices plummeted in June. 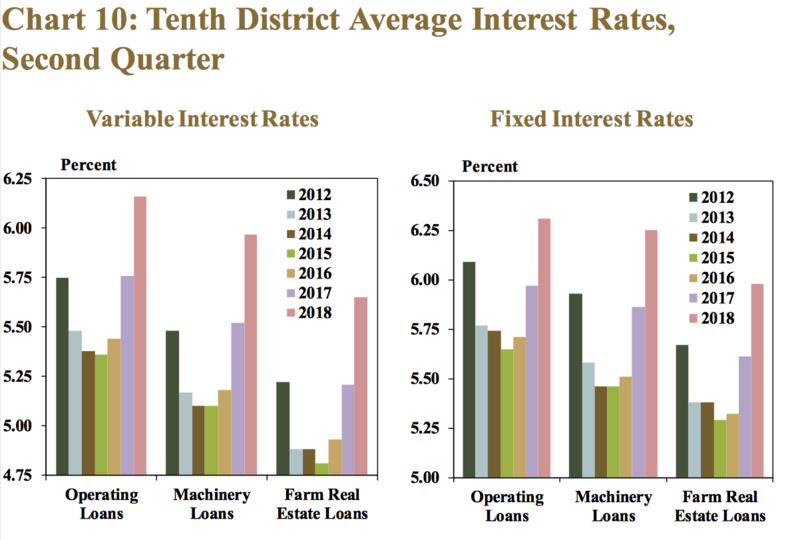 In contrast to earlier signs of income stabilization, more District bankers reported a decrease in farm income. 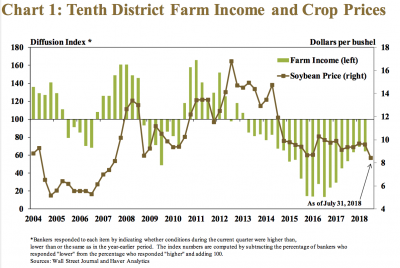 The sharp decline in crop prices likely contributed to reduced income. 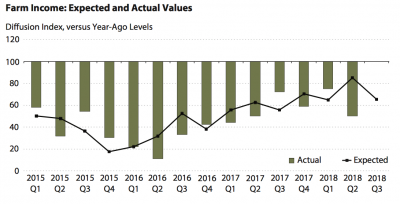 In June alone, prices for U.S. soybeans dropped 17 percent. 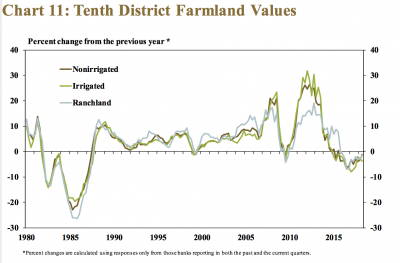 In addition, from the beginning of May to mid-July, corn prices also dropped 17 percent. 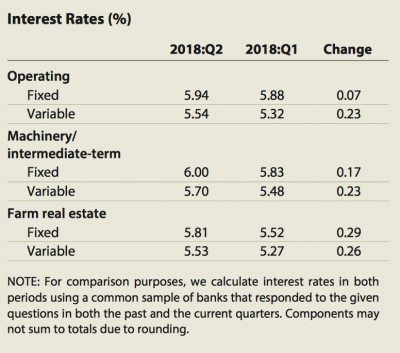 While addressing interest rates, Kauffman and Kreitman stated, “Interest rates on farm loans continued to rise in the second quarter, building on those of a year ago. 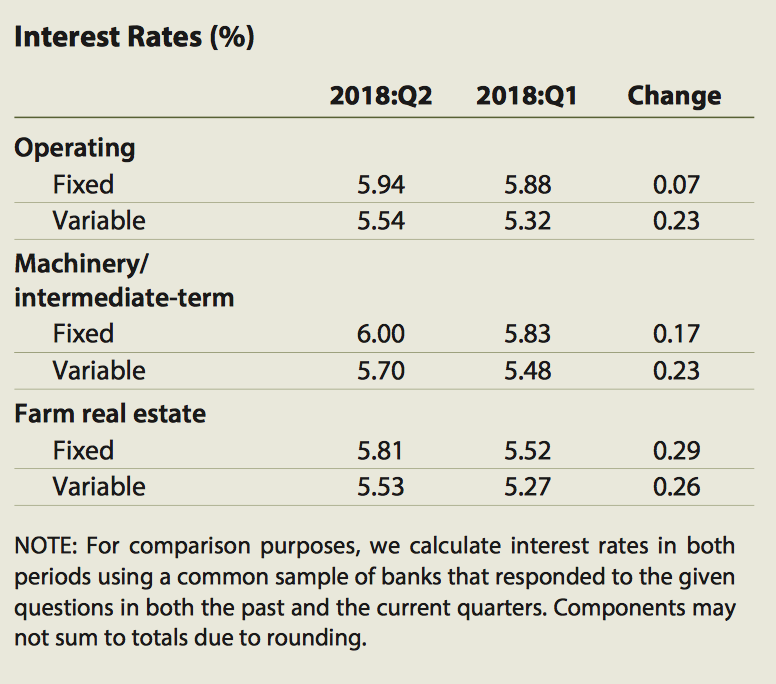 The increase in the second quarter was largest for variables rate loans, growing about 6 basis points more than fixed rates for the same type of loan. 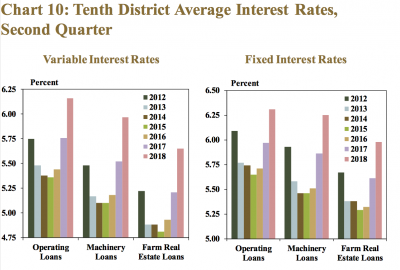 While increased interest expenses are unlikely to have a significant impact on farm income in the short term, higher rates are likely to influence decisions in making longer-term capital and real estate purchases.